Equip yourself with only the best during HVAC installation with the Malco 5 Blade Sheet Metal Crimper. Each crimp from this tool creates long, shallow double crimps that replicates factory indentations. These longer shallower crimps result in a tighter fitting, more self supporting, leak proof connection. Made with nickel plating to help resist corrosion and hardened steel for greater strength and resistance to abuse. The Malco 5 Blade Sheet Metal Crimper also features comfortable ergonomic RedLine Handle’s. These handles offer non-slip handle grip contours, spring handle actuation, and a thumb operated handle latch. 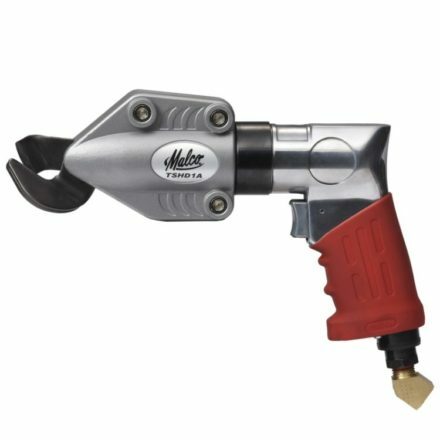 The engineered handle opening of the tool compliments the natural power stroke of any user’s hand. • Quickly downsize ends of round duct and stove pipe. • Creates a tight fitting, more self-supporting crimp connection. • Compound leverage produces 7 to 1 mechanical advantage. • Ergonomic Redline Handles won’t wear you down. Unless you're a contractor doing a lot of vent work, you won't use this much. But when you need it, you need it. This is very easy to use and gives a very nice, professional looking crimp. It met expectations. It fulfills a need I had for which I had no other solutions. It was easy to use. Like the lock location, (better than older version) We use this EVERY DAY. Looks well constructed. Would buy it again. The Malco C5R Crimper met my expectations and the price was well worth the value I received. Job well done. Best bang for your buck here. Light, sturdy, easily used! I've been in the hvac industry 26 years and have tried all the latest and greatest tools,but if it don't say MALCO in my tool bag it does not go period! ALL TOOLS ARE NOT CREATED EQUALLY. I bought this tool because I needed to fit the same size pipe into another of similar size. I tried & I tried & couldn't get them to connect. I saw this tool while my heating duct work was being worked on & decided this was a tool to have! I bought it & used it on one end of the 3" pipe & walla! It fit fine!Very well made & is well worth the price.